In large bowl, mix bread crumbs, milk, egg, cilantro, 2 cloves garlic, the salt, pepper, 1/2 teaspoon cinnamon, the cumin, coriander and ginger. Add beef; mix just until combined. Shape beef mixture into 20 (1 1/2-inch) meatballs. In 12-inch skillet, heat oil over medium-high heat. Add meatballs; cook about 5 minutes, turning frequently, until browned. Remove meatballs from skillet. Add onion; cook 5 to 7 minutes, stirring frequently, until softened. Add 3 cloves garlic, the turmeric and 1/2 teaspoon cinnamon; cook and stir 1 minute. Add broth and tomatoes. Heat to boiling; arrange meatballs in skillet. Reduce heat to medium-low; simmer 15 to 20 minutes, stirring occasionally, until sauce is thickened and meatballs are thoroughly cooked (at least 160°F). 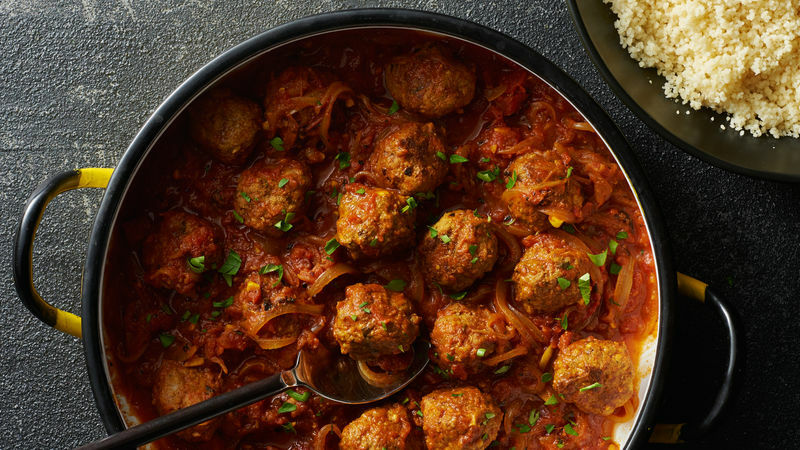 Serve these meatballs with couscous or buttered orzo for a well-rounded dinner. Chopped parsley adds a flavorful and pretty garnish. Do a pantry check with your spices; if the spices are over a year old, replace them.